Will the Azusa Pacific University/Citrus College Gold Line Station open in March? photo: Joe Linton/Streetsblog L.A. Yesterday, Streetsie-nominee Steve Scauzillo broke the news at the San Gabriel Valley Tribune: the city of Azusa, Azusa Pacific University (APU), and Azusa developer Rosedale Land Partners have written to Metro to delay the opening of the APU/Citrus College Station. The APU station is the farthest east of six new Metro Gold Line rail stations set to open on Saturday March 5. The APU station is finished, but work extending Citrus Avenue to the station parking lot is not. Site plan from Metro Gold Line Foothill Extension Construction Authority. 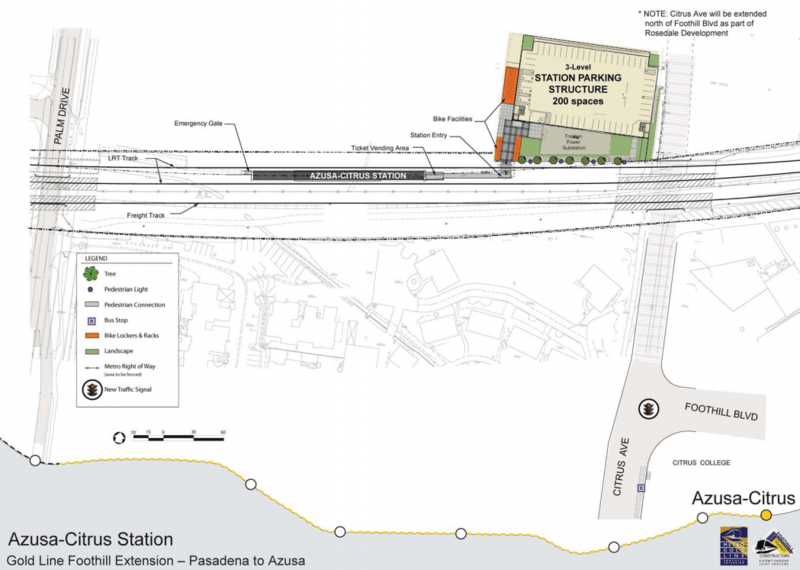 According to the Tribune, the Azusa interests are concerned that opening the APU station “will cause traffic jams and unsafe pedestrian crossings.” What’s causing this problem? The delay is due to construction not being complete on a road that leads to the station parking structure. And why is the parking structure road delayed? Because, according to the Tribune, the cities of Azusa and Glendora, and the developer Rosedale Land Partners “could not agree on the road’s alignment.” Those are, of course, the same folks now requesting the delay. My first thoughts reading this news is that there is an irritating double standard going on here. When Caltrans builds a freeway, they use all kinds of biased, flawed metrics – including Level of Service – to show that opening the freeway will reduce congestion, not only on the freeway itself but also on nearby surface streets. Freeway projects are also promoted as improving safety and reducing air pollution. The truth is, of course, that freeways worsen congestion, safety, and the environment. When communities fight freeways on their actual ill effects, government bureaucracies ignore the truth and just keep building and widening them. Transit investments are the opposite. Rail travel is orders of magnitude safer than car travel. It is also dramatically better for air quality. In reality, despite rosy promises, new rail lines will not solve congestion issues, but do not make them worse. Reading the Tribune, it seems to me that Azusa leaders are blaming rail for problems that it does not create. Also, the way I see it, delaying the Gold Line station opening is likely to make things less safe for some people. If some future riders, perhaps college students, drive instead of riding the train, then they will be less safe. If a rider would would have taken a (statistically very safe) train trip and replaced it with a (statistically much less safe) car trip, then delaying the station opening makes things less safe. My second thoughts were more encouraging. It is encouraging that folks in Azusa expect the Gold Line to be transformational. It would be a nice problem to have if early ridership is actually high enough to cause traffic jams. My guess is that a suburban station – one with no parking (or, in this case, limited access to lots of parking) – just will not be all that busy in its first few months of operation. Especially when there are plenty of other parking structures just down the line. Downtown Azusa Station, one mile west, has a multi-story structure with 200 parking spaces for drivers who ride the Gold Line. It is also encouraging that Azusa ultimately does want and does welcome this train. Azusa interests are calling for a delay, not full-on opposing the train. City officials heartily celebrated their new stations in September. Rosedale includes the Gold Line station on its promotional map. Metro has not made a decision on the Azusa delay request. Metro and the Gold Line Foothill Extension Construction Authority would undoubtedly like to open all six stations as planned in March. But Metro needs to get along with Azusa, in the interest of fostering a good relationship that helps make future collaboration go smoothly. With a November Measure R2.1 transportation tax vote in the balance, Metro CEO Phil Washington and his board need to do what they can to win the hearts and minds of the electorate, and the local officials that can influence it. I wouldn’t blame Metro for playing as nicely as possible with Azusa constituents at this juncture. Though the rationale doesn’t make much sense to me, it is only four months. An extra station opening celebration this summer could make for extra positive headline going into the November ballot measure vote. I’m not sure who dropped the ball on the Citrus Ave. extension project. Apparently it involves the Cities of Azusa and Glendora (it’s right on the boundary line), the Gold Line Construction Authority, the Rosedale residential development and probably some other entities. These photos are from last November–I don’t think the scene has changed much since then. I agree that delaying the last station opening would indeed create that little bit of extra buzz when it finally opens. Plus, having one less station initially might cause the Gold Line to demand slightly fewer railcars which are anticipated to be in short supply once the Expo Line extension opens in summer. One issue for Metro will be whether it can turn back its trains a station earlier without too much impact on service. Anyone here know about where the rail crossovers are on the line who could answer that question? My guess would be that there are a number of them, but whether they’re designed to handle full operations just turning around a station earlier than Azusa would be questionable. I disagree with Joe completely about the delay, and said as much in my email to Phil Washington and the MTA Board – which they apparently agreed with. I am concerned about today’s article in the San Gabriel Valley Tribune regarding the Gold Line stopping short of its final destination at APU/Citrus College and ending in Downtown Azusa. The Gold Line has long been expected for members of the Rosedale community, and also provides access to Citrus College and to bus lines in the area. Even with the walk to Foothill Boulevard, taking the Gold Line to Citrus College will be more time effective than transferring to a shuttle bus. This shuttle bus will likely not observe the same service hours as the Gold Line. that) and traffic modification from Palm Drive to Foothill Boulevard to only allow right-in and right-out on a temporary basis, possibly by placing bollards in the roadway. Add temporary no parking or permit only parking within a half mile radius of the station to prevent cars from using the neighborhood as a park and ride. Palm Drive is a public street and riders can walk along that route. Fencing and security guards may be necessary in order to prevent people from going through the construction site. However, that cost is likely less than running a shuttle bus from 5 am to midnight, seven days a week, to cover the gap. And, as someone who was excited when the Gold Line was being opened March 5, the Gold Line needs to operate Metro’s normal rail service hours and any shuttle bus replacement would also need to operate those hours. Foothill Transit has made service changes in the Citrus College area specifically to improve Gold Line connections, and those improvements would be wasted for several months. 2016 could have made their concerns known. With all the publicity related to the Gold Line opening, having the route stop short, with such late notice, will jeopardize Metro’s credibility, especially given staff’s push for a tax increase and extension of Measure R, which requires a 2/3 vote of the public. Metro has been very careful not to overpromise in regards to Measure R related projects and this should not happen again. Let’s hope that Metro is prepared to fight further to get this station open. I passed by it today and found this fence and road sign blocking access. Will they be removed by Azusa and Rosedale before March 5th? Oy. So open the station and leave the parking garage closed. See how much walkup traffic there is! Good for them. I hate to see really dumb requests accomodated. That’s kind of hilarious. What a photo. Proof that Los Angeles is too balkanized. As of a few days ago, Metro declared that the whole line would open on the 5th of March, and work-arounds have been discussed for dealing with the delays in the Citrus Ave. completion. Not funny to the people who have to take the long way around to reach the station. As far as “Los Angeles [County] is too balkanized”, it’s true that a look at the Thomas Brothers map for the San Gabriel Valley shows a crazy quilt of cities and county territory, but in the San Fernando Valley, most of that region is part of the City of Los Angeles, and ever so often there’s a campaign to secede from the big city and be self-governing. Too bad no one thought to tell them a train was going to be coming by one day.